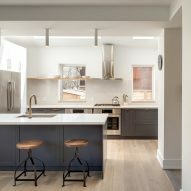 Toronto firm StudioAC has gutted a Victorian property in the city to reconfigure the layout and create more spaces for entertaining. The Hilton House, which dates back almost 100 years, is located east of the Wychwood Barns arts centre, northwest of Downtown Toronto. 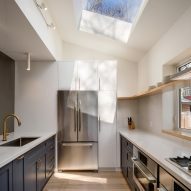 Previously divided into two apartments, the building was returned to a single family home during StudioAC's overhaul. 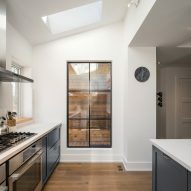 "Our clients came to us looking to maintain the street presence of the home, while opening up the interiors and modernising the space," said the studio, which is gaining a reputation for its contemporary renovations of Toronto properties. StudioAC, set up by architects Jennifer Kudlats and Andrew Hill in 2015, recently inserted a plywood unit complete with a dog bed into a home. 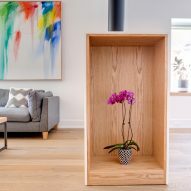 The firm's portfolio also includes an apartment with a sleeping nook in a white box and a house redesigned to mimic the owner's former New York apartment. 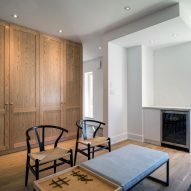 At Hilton House, partition walls on the ground floor were removed to create an open-plan living space running front to back. 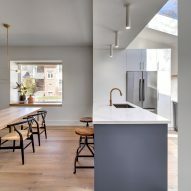 A single-storey, timber-clad extension was added to the rear, providing more room for the kitchen and incorporating skylights for better natural illumination. Between the lounge and dining areas is a fireplace, which forms a partial divide. A white box surrounds the hearth and a black flue sticks out of the tip, while a wood-lined compartment on the side is used to display flowers. "Living and dining are separated by an objectified hearth that sits as a totemic element allowing site lines to continue through the programatic divide," said StudioAC. 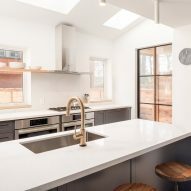 A simple material palette of white-painted and wooden surfaces is contrasted by the dark grey kitchen island and cupboards, and stainless steel appliances. 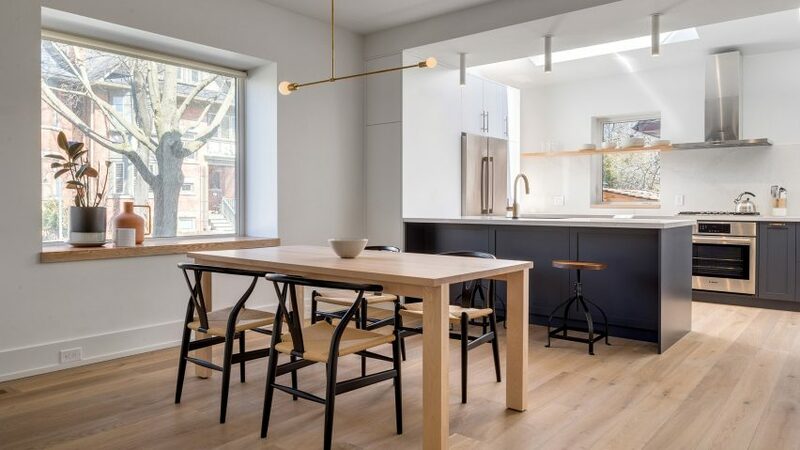 Black-framed Wishbone chairs by Danish modernist designer Hans J Wegner also stand out. 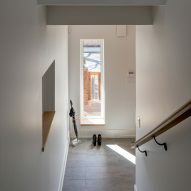 Ancillary spaces like storage, a mud room, a bathroom and the stairs are all concealed behind a built-out wall. On the level above, the open-style layout is repeated. 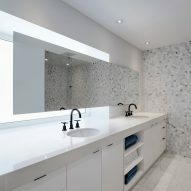 The master bedroom and ensuite occupy one side of this storey, with a dressing area in between. Marbled flooring and hexagonal tiles are used across the bathroom, marking the change in function from the sleeping area's wooden floor and white walls. 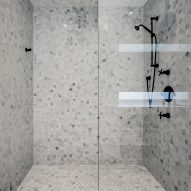 "The master bath features a large open concept shower and a cantilevered vanity mirror that stretches beyond a large frosted window," the studio said. The remainder of the first floor is taken up by a study and a utility room. The attic space houses two additional bedrooms, each with exposed wooden ceiling beams, which share a bathroom. "By carrying an open concept throughout the entire space, this home that was once broken up into many rooms within many units is now flooded with light and our clients can happily entertain both indoors and out all year round," said StudioAC.